Jay Doerling, Professor of Civil Engineering at the University of Manitoba reflects and comments on Manitoba government flood fighting efforts, flood forecasting, and approaches to managing 2011 flood waters. He has released his analysis with recommendations, and Manitoba Wildlands is posting it for citizen information. Preliminary work has begun on a $100-million emergency channel to drain water from Lake St. Martin through the new channel to the Dauphin River and into Lake Winnipeg. 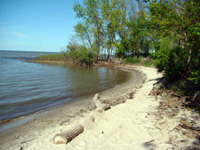 It is hoped, but not guaranteed, that work will be completed by November 2011 to prevent further Lake Manitoba flooding in 2012. Manitoba wants the Canadian Government to cover 90 per cent of the costs under federal disaster assistance, but no assurances have been given. The five-mile (8 kilometre) long, 300 ft. (90 meters) wide, 25 ft. (7.5 meters) deep channel is expected to involve excavation of as much as 88 million cubic ft. (2.5 million cubic metres) of earth, 50 pieces of heavy equipment, and 150 staff. Barges, helicopters, and helicopter landing pads to get equipment and staff into areas inaccessible by road are required. "This project will amount to one of the largest and most challenging engineering projects ever undertaken in Manitoba on an emergency basis," said an engineers report by AECOM and KGS Group. The engineering report commissioned by the province makes little mention of potential environmental impacts, such as: the transfer between water-bodies, introduction of foreign species, and sedimentation. Manitoba Wildlands was unable to find any public information about permitting and licensing for the channel. 2011 flooding in Manitoba has been particularly severe. Manitoba struggled to contain the swollen Assiniboine River by operating the Portage Diversion well over its design capacity. The Portage Diversion channels water from the Assiniboine River into Lake Manitoba. This exacerbated flooding on Lake Manitoba, flooding up to 800 dwellings, cutting off roads and causing considerable damage when storms whipped up waves that slammed into homes and cottages. "It is understandable the Manitoba government wants to act quickly to prevent flooding. We must make sure that hasty action does not come at the expense of our aquatic ecosystems. The government needs to ensure potential ecological impacts are identified. Also we would expect full disclosure of ongoing information about the channel project," said Manitoba Wildlands Director Gaile Whelan Enns. University of Manitoba engineering professor Jay Doering has questioned the viability of such a channel. "It's very naive of us to believe that we can control the level of Lake Manitoba to the extent that we want to. My concern is the government is simply looking for a quick fix to a politically contentious issue," said Doering. 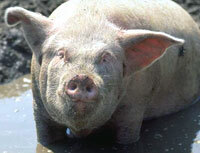 A regulation under the Environment Act for a moratorium on new hog barns and manure storage facilities in the Red River valley, and zones identified in an earlier announcement takes effect in April 2008. Permits for pig manure storage facilities; pig barns, and barn expansions are temporarily suspended until August 31, 2008. New legislation will be introduced in spring 2008. The legislation will replace the interim regulation. Areas with intensive hog operations are of greatest concern because hog barns are too close together or the land is prone to widespread flooding - threatening watershed health and sensitive ecologies including wetlands. Manitoba Pork Council, Keystone Agriculture Producers and the Manitoba Chambers of Commerce are seeking to have the regulation reversed. 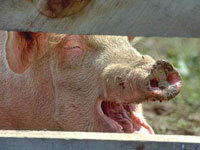 The hog industry in Manitoba is facing economic challenges. A new provincial program to fund downsizing of operations has been put in place spring 2008. Some critics of this decision wish to see the moratorium apply to the whole province, as it did during interim measures prior to the Clean Environment Commission hearings, and report. In January 2006, the CEC held three public 'scoping' meetings in Friedensfeld, Winnipeg and Morden, to engage the public in identifying issues to be addressed by the CEC Panel. Presentations were made by groups and members of the public at the January 22-24th scoping meetings. The CEC Panel developed guidelines for the upcoming public meetings scheduled for March and April 2007. Applications for participant assistance for groups and individuals will be accepted by the CEC until the conclusion of the public meetings. Upon completion of the review, the CEC will prepare a report for the Minister that reflects public presentations and feedback as well as the results from their investigations. The report will consider efforts in other jurisdictions to manage hog production as well as review contents of the report An Examination of the Environmental Sustainability of the Hog Industry in Manitoba. On March 3, 2008 Conservation Minister Stan Struthers released the December 2007 Clean Environment Commission (CEC) report, Environmental Sustainability and Hog Production in Manitoba. The investigation leading to the report completed in December 2007 and a final report was provided to government on Feb. 6, 2008. 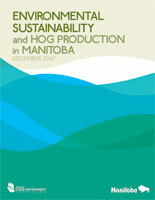 The CEC report includes 48 recommendations related to the sustainability of hog production in Manitoba. Conservation Minister Struthers indicated the government has accepted the CEC report and recommendations in principle. On March 18 public review closed for an interim regulation under Manitoba's Environment Act for zones regarding new industrial hog operations. The regulation, termed another pause in new licenses by government staff, expires July 15, 2008. The Manitoba government has indicated that it intends to pass legislation by July formalizing its actions on the regulations, especially the zones where new operations are banned. Community and environmental organizations have suggested Manitoba's auditor general investigate how the CEC review of the industry was handled, especially in terms of access to information, ability to participate, scientific and economic studies, and interpretation of the 'reference' for the hearings and investigation. OlyWest, a consortium of hog growers and processors from Quebec, Saskatchewan and Manitoba, filed a proposal and environmental impact statement (EIS) on August 29, 2006 under the Manitoba Environment Act (Public Registry File #5155.00) for a $200-million project that is expected to slaughter from 18,000 to 45,000 hogs per week. According to OlyWest's EIS, "[t]he proposed facility will include an integrated protein recycling system, a truck wash, a holding area for up to 2,780 hogs, an asphyxiation area, kill floor, coolers, cut floor, packaging, refrigeration and freezing, and a shipping area in addition to other processes." Manitoba Wildlands filed comments on OlyWest's proposed project EIS. OlyWest's proposed project was accepted as a Class 1 Development according to Manitoba's Environment Act - the Class that normally requires the least amount of scrutiny under the Act. However the level of public concern and opposition to the project combined with the City of Winnipeg and Province of Manitoba's support for OlyWest in advance of public consultation and licencing caused the Minister of Conservation to announce Clean Environment Commission Hearings for OlyWest. Public participants will be able to apply for funds to participate in the OlyWest hearings through Manitoba's Participant Assistance Program. Manitoba Wildlands has also compiled a chronology of the OlyWest project. Business, environmental and residents' groups have opposed and criticized OlyWest's proposed project since it was announced. On October 6, 2006 these groups and individual opponents banded together as the OlyOpp Alliance and formed the NoWinniPig campaign, in the hope that the proposed OlyWest hog slaughtering and processing plant will not be located in the city. 10 city council candidates for the October 25, 2006 Winnipeg civic election have been endorsed by the OlyOpp Alliance and are committed to halting the proposed hog slaughter and processing project. Members of the OlyOpp Alliance oppose the OlyWest project for various reasons; however, some of the most common reasons for opposition to OlyWest include odour issues, unresolved questions and concerns regarding water treatment and possible contamination, and the increased pressure on traffic and sewage systems. There is concern about the level of subsidies, loans, free land, and other benefits to the company. One of the three partners in Oly West is 89% owned by the Saskatchewan government. Two of three partners involved in the proposed OlyWest hog processing plant in Winnipeg announced they are pulling out of the project, December 2006. Olymel of Quebec indicated financial troubles were a significant factor in its decision, but it and Big Sky Farms of Humboldt, Sask. also cited the Manitoba government moratorium on new and expanding hog operations imposed November, 2006 Manitoba as a factor. OlyWest has repeatedly stated that existing hog barns would supply the proposed slaughter plant. Although the remaining partner, Hytek, said it will proceed with the project on its own, financial incentive packages from the City of Winnipeg and the Province will now have to be revisited. Hytek must resubmit a proposal to the city because the existing agreement refers to a three-party consortium. Manitoba will also look at whether Hytek still qualifies for a $20-million provincial loan promised to the OlyWest consortium at preferential rates. Hyteck may also have to resubmit the environmental licence application now the licence applicants are no longer the same. The Association of Professional Engineers Manitoba has started an investigation at the request of the Oly Opp business group in St. Boniface regarding potential conflict of interest by Earth Tech. The firm is the designing engineers firm for both OlyWest and the Winnipeg waste water treatment center upgrades the OlyWest plant is dependant upon. Earth Tech also provided the EA for the OlyWest plant. Clean Environment Commission hearings may or may not be held early in 2007. November 21, 2006 - OlyWest Investigation, Hearing Delay? Hytek Ltd., only remaining partner of the OlyWest group that had planned to build a pork-processing plant in Winnipeg, has set its sights on Neepawa. Hytek Ltd. announced October 11th it is buying the Springhill Farms hog-kill plant in Neepawa, a town of 3,300 people, located 170 kilometres northwest of Winnipeg. If the purchase goes through, plans for a controversial $200-million plant in Winnipeg would be shelved and proposal for OlyWest will be withdrawn, says Hytek vice-president Guy Baudry. Baudry also says the company will spend $35 million to boost the plant's kill rate to its rated capacity of 4,000 hogs per day, as well as capacity to add value by producing new specialized cuts. These improvements are projected to add 200 new jobs to the current 350 jobs. Springhill Farms was founded 1986 by the Hutterite Brethren. The plant shut down indefinitely in 2003, dues to hard economic times in the pork industry, but re-opened later that year following a $3 million provincial loan. Minnedosa is proposing to obtain the water from existing wells. They also propose that in times of water shortage, surface water stored in Lake Minnedosa will augment flows downstream of Minnedosa, (on the Little Saskatchewan River). The primary driver of the town of Minnedosa's proposal is the Husky Oil Ethanol plant, which is currently under construction. The environmental review of Husky's ethanol proposal failed to conduct an evaluation of the area's water supply to determine if there was enough water to supply the proposed ethanol plant. As a result, the Town of Minnedosa requires this upgrade in order to accommodate Husky's water needs, which not only were not considered as part of the review of Husky's project, but have since increased beyond predicted expectations. Manitoba Wildlands, along with other concerned groups, contend that not enough information has been provided to determine whether there will be enough water in the Little Saskatchewan River system and Lake Minnedosa to protect the environment and supply water to other users, upstream and downstream of the proposed project. We have requested the Minister to direct the Clean Environment Commission (CEC) to hold public hearings for this project, and have asked that any Environmental Licences issued to Husky Energy for their new/expanded ethanol plant be suspended until concerns regarding the adequacy of water supply in the system have been satisfied and the CEC has made its recommendations. Information regarding the Town of Minnedosa's proposed Water Supply Upgrade Project is not available on the internet. Materials have been placed in the Public Registry (PR File #5205.00). On September 16, 2002 a valve broke at a Pollution Control Centre in the City of Winnipeg, resulting in 427 million cubic meters of untreated, unfiltered sewage (enough to fill 57 Olympic-size swimming pools) being dumped into the Red River. As a result of the spill, in late 2002 the Government of Manitoba convened Clean Environment Commission (CEC) hearings to examine the City of Winnipeg's Wastewater Treatment System. In the fall of 2003, the CEC released its report on the City of Winnipeg's Wastewater Collection and Treatment Systems Investigation. Further information is available through the public registry system (File No. 4864.00). Environment Canada also investigated the spill and its effects, and in May of 2004 announced that it was charging the City of Winnipeg under the section of the Fisheries Act that protects fish-bearing waters from "the deposit of any substance that is deleterious to fish and aquatic life." The City of Winnipeg is pleading 'not guilty' to the charges, which carry a maximum penalty of $300,000. In October 2004, the court date was moved into November. The total cost to the City of Winnipeg to upgrade wastewater treatment systems so that such spills will not occur in the future is estimated to be $750,000,000. Controversy exists regarding the ability of the city to carry this cost, when the upgrade to the wastewater treatment system will be done, and whether the Government of Manitoba will assist the City with the work. The CEC recommended that Winnipeg accelerate its intended capital works schedule. In February 2002, the CEC releases its Report on Public Hearings for the Simplot Potato Processing Plant and the City of Portage la Prairie Water Pollution and Control Facility Alterations. Further information can be viewed at any of the public registry locations (File No. 4655.00). Red River Valley is a drought-prone region; its inhabitants rely on the river and its tributaries to supply water needs. Based on assumed water shortages the US Department of the Interior Bureau of Reclamation and the State of North Dakota released a Final Environmental Impact Statement for the Red River Valley Water Supply Project in January 2008. The report lists environmental effects of six alternatives (including no action) to meet assumed water quality and quantity needs of the US Red River Valley. The preferred alternative was the Garrison Diversion Unit Import to Sheyenne River. There are currently 1,600 intakes for municipal water and irrigation from the Missouri River. Despite this the EIS recommends inter basin transfer from the Missouri River as a more reliable water source than the Red River and Minnesota groundwater. The report claims regional aquifers will not be affected. Wildlife and Federal and State protected species may experience some adverse affects. Historic properties and areas of cultural importance for US Tribes may also see adverse affects. The Manitoba government has objected over twenty years to US water engineering plans that involve Garrison Diversion and inter basin transfers of waters with risk of effects that flow downstream into Manitoba along the Red River system into Lake Winnipeg and beyond. The Boundary Waters Treaty with referral to the International Joint Commission are mechanisms to deal with the threat to Manitoba through bilateral EA and analysis. These mechanisms have not been utilized. "None of the options identified to meet the presumed water needs in the Dakotas included first stage water conservation targets. On that basis we have unsubstantiated projected water needs driving inter basin water transfers coming all the way to Manitoba," said Gaile Whelan Enns, director, Manitoba Wildlands. See below for previous stages of this Transboundary Water project. The US Congress passed the DWRA (Dakota Water Resources Act of 2000). Sections 5 and 8 of DWRA authorize the Red River Valley Water Supply Project. Section 8 directs the Secretary of the Interior to conduct a comprehensive study of the water quality and quantity needs of the Red River Valley in North Dakota and possible options for meeting those needs. 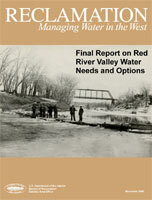 The purpose of the Red River Valley Water Supply Project is "to identify reliable sources of water of sufficient quantity and quality to supply homes, businesses, industries, wildlife, and recreation in the Red River Valley within North Dakota through at least the next five decades"; the Red River Valley Water Supply Project Environmental Impact Statement (EIS) will evaluate alternative ways to meet the comprehensive "water quality and quantity needs of the Red River Valley in North Dakota" [DWRA Section 8(b)(1)]. The needs are defined as municipal, rural, and industrial supplies; water quality; aquatic environment; recreation; and water conservation measures. To address the requirement for the Secretary of the Interior to conduct a comprehensive study of the water quality and quantity needs of the Red River Valley in North Dakota, the Red River Valley Draft Report on Water Needs and Options was prepared. The public comment period for this draft report closed on October 3, 2005. 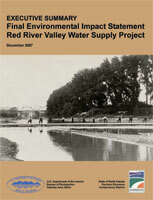 The Draft Environmental Impact Statement for the Red River Valley Water Supply Project was released in January 2006. Public hearings regarding the draft EIS were held in February 2006. The public review period was to end March 30, 2006. It was extended to April 14, 2006 and was then held over. The public comment period regarding the draft Environmental Impact Statement (DEIS) for the Red River Valley Water Supply Project (RRVWSP) remained open throughout much of 2006. Manitoba Wildlands submitted comments on the DEIS for the Red River Valley Water Supply Project (RRVWSP). The Supplemental Draft Environmental Impact Statement (DEIS) for the Red River Valley Water Supply Project was released on January 31, 2007. The Supplemental DEIS contains significant revisions to the Draft Environmental Impact Statement (DEIS) of December 30, 2005, and was written to incorporate responses to substantive comments related to environmental issues received as part of the public comment process for the DEIS. To date in this process, North Dakota continues to ignore assertions by concerned citizens, environmental groups, as well as the Government of Manitoba that in-basin solutions to meet future water supply needs in the Red River Valley are the only acceptable options. The question of how Aboriginal Rights will be upheld and accommodated in Canada and the US has not been adequately addressed in the review process. North Dakota also continues to ignore calls for the project to be referred to the International Joint Commission for review. Under the Boundary Waters Treaty of 1909, both Canada and the US must make such a request in order for the IJC to intervene in the matter. The public comment period for the Supplemental DEIS closed on March 26, 2007.